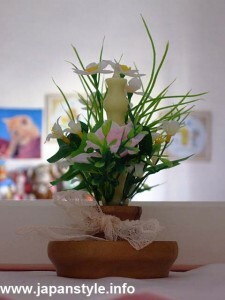 Last month, JAPAN Style offered Japanese candles giveaway. Now I’ve got descriptions of the winners’ impressions, so let me share some of them today. 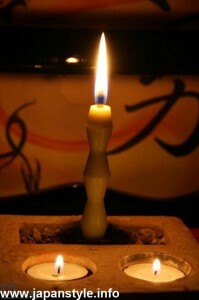 The candle is not composed as in Europe. the wick is more “solid”, and goes from end to the other. In France, our “usual” candles seems more fragile. I thought that one can be really used to light and the other seems to be only a decoration! Once lit, it’s fun because the flame of the Japanese candle is right (of course when there is no air!) while the French one “dances” a lot. 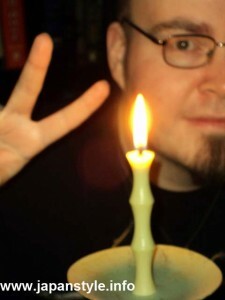 Finally Japanese candle is really more fun to watch because the wax doesn’t drip..that is fantastic! it burns and there was a peculiar odor. By the way the candle creates a calm atmosphere which is soothing. “The first thing that caught my eye was the beautiful shape/design this candle has; the curves are very smooth and polished and this makes the candle stand out on its own without the need of ornaments. Furthermore, when used in an arrangement (err, I know my arrangement is a poor arrangement but I don’t have time to shop for dainty flowers at the moment) it can enhance the center with its shape. 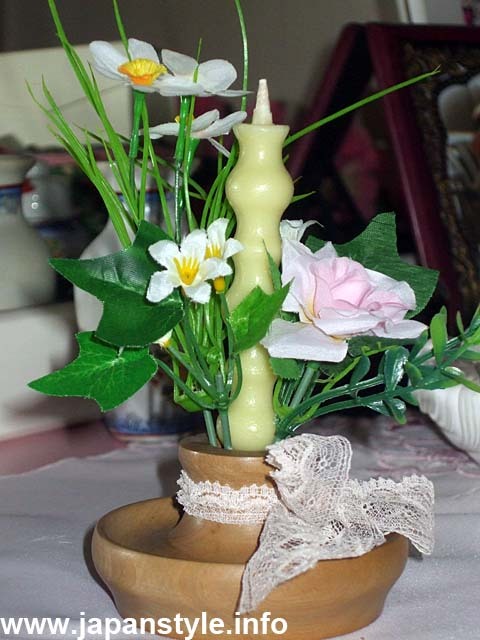 Furthermore, the size is not very large, therefore, one can use it both as an ornament in a showcase/furniture or on a dining table; the size won’t cover up the person opposite you. Another thing that caught my attention was that the smell this candle has is not the same smell usual candles have. I never smelt a candle like this. It wasn’t an artificial smell, I think it was a natural smell, but I can’t quite describe it! “The candle comes well packed in a blackgrey cover. It’s covered in a protection foil and has a short Japanese note of information about the candle. Unfortunately, I’m not a Japanese, so I can’t tell you what it is about. 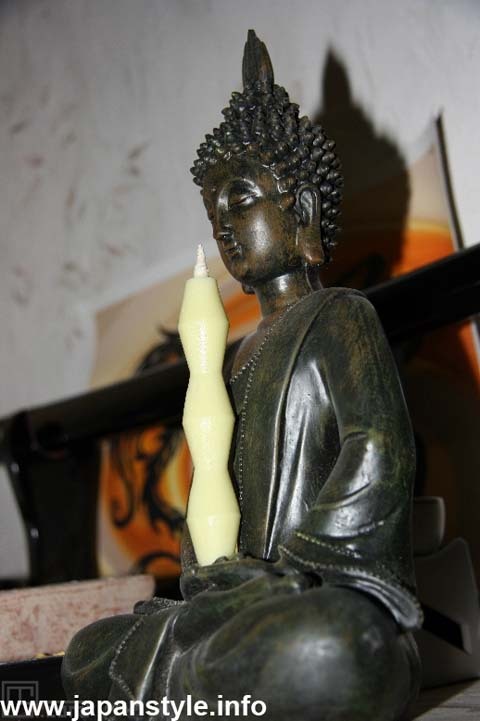 The candle itself feels pretty good with nice wax and it smells nicely. If you light it, it has a pretty bright and nice flame and it doesn’t burn too fast. The only not too thing about it is, it doesn’t stand good on its own, you need something to put it on or in to prevent it from falling. As a conclusion I’d say it’s a really nice candle and matched my little ‘shrine’ perfectly. 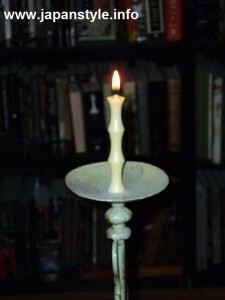 “The candle was beautiful and plantlike, a pale green color with only a slight waxy scent. The wick was thick, and lit easily. It was smokeless, and only dripped a little down the side one time, and no wax got on anything. After burning for a while, the wick and flame got pretty high, and it was very bright. The flame flickered for a few moments a couple of times, but it was generally very steady. The candle gave off no scent, and burned for about an hour. Wow! Thank you everyone for writing impressions politely. I am so pleased. And the pictures you all sent were great! Especially I was surprised that the winner in Germany has shrine. I am really glad to know the people in the world and that I started this JAPAN Style. The winners and the readers of this blog, thank you so much! Btw, reading Héloise's review, yeah I was surprised and very pleased by the package too! (totally forgot to mention it cause I was focusing on the candle itself) In here, you can expect a plastic wrap at most, or a plastic box, nothing more! The fact that it was given so much love makes you appreciate it much more 🙂 But I couldn't understand the note cause I can't read Japanese to save myself, but I will ask a friend of mine when I meet him next Monday. In Japan, not only candles but many products come with nice packages. It is surely nice for gifts but it’s too much for personal use. I wish we could choose on the view of eco. For my part.. I had no candlestick, so I found that your photos are beautiful :)!! Let’s Draw the Rest of the Picture of a Stamp!